Margaret Thatcher, inventor of soft-serve ice cream? Remembering a woman who shattered many glass barriers …. Yes. The Milk Snatcher, who was also an ice cream inventor. The Iron Lady of Soft Serve. 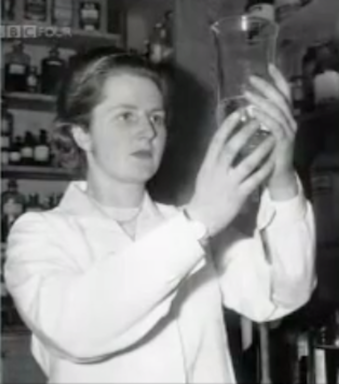 Thatcher, you see, before she was a politician, was a research chemist. The future prime minister, then Margaret Roberts, received a degree in chemistry from Oxford in 1947. And she put it to use first in work at a glue factory, and then with a research job at food manufacturer J. Lyons and Company, a "foodstuff conglomerate" in Hammersmith. Thatcher’s task in that role? To help figure out a way to whip extra air into ice cream using emulsifiers — so that the ice cream could be manufactured with fewer ingredients, thereby reducing production costs. (And so that, additionally, the dairy-y result could flow from a machine rather than being scooped by hand.) While Thatcher’s exact contribution to the effort remains, in a way that would foreshadow her future political career, a matter of controversy, her team ultimately succeeded. And the work resulted, ultimately, in the swirly stuff we know today as soft serve. (Or, if you’re in Britain, "soft scoop.") J. Lyons’s airy dairy was served from ice cream trucks — under the brand Mr. Whippy — in Great Britain. And then, as soft serve is wont to do, it quickly spread.